Everyone loves sugar; whether you like just a dash of sugar in your coffee to balance out the bitterness, or a heaping mound of sugar in your desserts to satisfy your insatiable sweet tooth, sugar is an essential ingredient in our everyday lives, especially when it comes to baking. But do we know just how essential it is, and how it all works? Sugar may just be a simple carbohydrate, but simple is the last thing that should be used to describe it. After discovering all the amazing powers that sugar holds, you won’t look at this so-called “simple carbohydrate” the same again! First of all, let’s take a look at sugar on the molecular level. Sugar is made up of carbon, hydrogen and oxygen, and contains a hydroxyl group, which makes the molecule very polar and therefore very soluble. Sugar also easily bonds with other molecules, and in doing so helps to hold on to the moisture of foods (which also makes it a natural preservative). 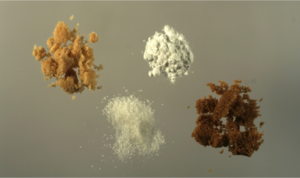 Common table sugar, and most other sugars, is actually formed by combing two simple sugars and forming a disaccharide, which is great at storing energy. Now let’s look at how this molecule works and interacts during baking. For example, adding sugar to recipes with flour helps to absorb water and prevent gluten development, which changes the texture of the baked good. The sugar forms strong bonds with water molecules so it helps to keep baked goods soft and moist. Additionally, adding a small amount of sugar will result in a denser texture, such as bread or rolls, and a larger amount of sugar will give a light fluffy texture, such as for cake and other pastries. Sugar also causes cakes and quick breads to rise while baking, because when sugar is mixed with fat, eggs and other liquid ingredients it creates air bubbles, which then expand in the oven causing the batter to rise. Sugar can also provide the crunchy textures to the outside of baked goods. This happens when moisture evaporates from the surface of foods while baking, allowing dissolved sugars to re-crystallize and create crunchy crusts. In ice cream, sugar helps to slow down the freezing process during the churning, which creates the rich and creamy texture we all know and love. In meringues, sugar helps to stabilize the structure. It does this by preventing the egg whites from being over-beaten by slowing down the production of foam, and it protects the foam from collapsing by dissolving in the water bubbles to support them. Sugar can also add a richer, deeper flavor to desserts by caramelizing. 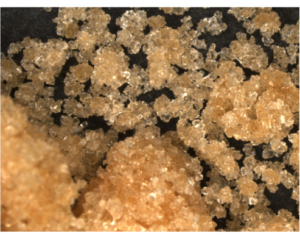 When sugar caramelizes, the molecule breaks down into smaller parts and turns a darker color with more complex, richer flavors. Clearly, sugar is a very powerful little molecule. But not only does it have this impressive skill set, there are many different kinds that each has its own unique identity. We asked a professional baker and food blogger, Amanda Light (from http://PrimandPropah.com), her opinions on a few different types of sugars. Using her advice, let’s take a look at these main types of sugars and what they bring to the table. 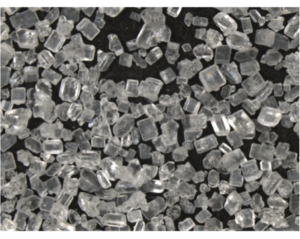 White granulated sugar is what we most commonly associate with the word sugar. It is very refined, so it does not contain any of the natural molasses. It is most commonly used in baking, and because of its extra fine crystals it does not clump together, which makes it easy to sprinkle on top of things or dissolve in liquids. Organic sugar, or brown crystalline, is similar to white sugar but it is less refined so it has a light brown color, and it can be used in the same way as white sugar, according to Amanda. Brown sugar is white sugar that has cane molasses added to it, and comes in either light or dark depending on the amount of molasses added. Brown sugar is better at retaining moisture than white sugar, so it makes baked goods extra moist. “There’s a reason your banana bread is super moist and yummy, it’s that brown sugar and banana!” says Amanda. Unfortunately, brown sugar can harden and clump much easier than white sugar, so it’s a good idea to store it in an airtight container. Liquid sugars, such as honey and agave, are sugars that have been dissolved in water before being used. They hold even more moisture than white or brown sugar, which results in an extra moist texture. Although Amanda says, “I don’t generally bake with honey or agave as my main sugar because I like the consistency of white and brown sugars more,” liquid sugars are great for recipes that first require the sugar to be dissolved. We hope these facts and tips about sugar will help you in your next baking adventure, and help you to realize the true power of sugar and why it’s so important!